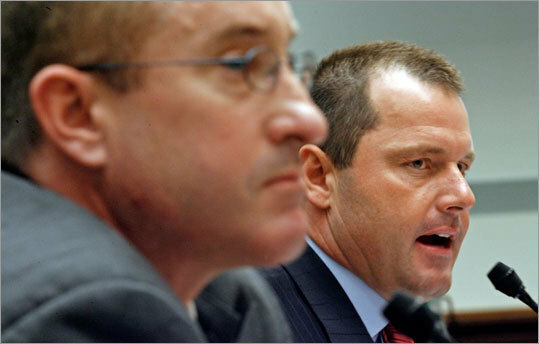 (Getty Images Photo / Chip Somodevilla) Major League Baseball pitcher Roger Clemens (right) and former Major League Baseball strength and conditioning coach Brian McNamee testify about allegations of steroid use by professional ball players before the U.S. House Oversight and Government Reform Committee on Capitol Hill February 13, 2008 in Washington, DC. Dirt flew in the halls of Congress today, and when the last mud was slung, everyone was smudged. Roger Clemens delivered his side of the story and again insisted he never used steroids or human growth hormone. The Rocket's accuser, Brian McNamee, explained his version of events, which were disclosed in the Mitchell Report. One of the two men perjured himself. It's all over now except for potential criminal charges, possible jail time, and Clemens's standing when he becomes eligible for the Hall of Fame. So, whom do you believe? The seven-time Cy Young Award winner or the weasly, disgraced trainer? Both men have been caught in numerous lies. It was pretty clear that most of the congressmen and women came to the hearing with their minds made up. Clemens last week visited more than 20 representatives -- an outrageous parade that compromised the hearing and painted numerous elected officials as fanboy/sycophants. Listening to the questions today, you could pretty much tell which reps got autographed baseballs and signed photos for their office walls. Representative Dan Burton, Republican of Indiana, was buffoon of the day (did you notice the Lone Star cuff links? ), bashing the media, reminding us that Roger is a "titan" in baseball, and invoking the old Ray Donovan question -- "Where do I get my reputation back?" Burton was shocked, shocked, that McNamee lied to reporters when asked about steroids back in the pre-Mitchell days. There was plenty more jock-sniffing. Representative Danny K. Davis, Democrat of Illinois, told Roger, "It was a pleasure meeting you last week." Representative William Lacy Clay, Democrat of Missouri, asked Roger what uniform he plans to wear into the Hall of Fame. Representative Virginia Foxx, Republican of North Carolina, produced four photographs of Clemens, a progression dating to his Red Sox days, and insisted, "You appear to be the same size." Good observation, Ginny. That's like saying Michael Jackson's features haven't changed since he posed for the cover of "Thriller." Hope they all have their autographed Rocket jerseys. Too bad they didn't bother to read Andy Pettitte's deposition. Clearly, committee chairman Henry A. Waxman believes Clemens is lying. In his closing statement, Waxman apologized to McNamee for some of the comments from the yahoo reps (one called him a drug dealer and another said, "Shame on you"). Clemens tried to interrupt the congressman's closing remarks and Waxman effectively told the Rocket to shut up. Waxman was not alone in siding with McNamee and the Mitchell Report. Late in the day, Representative Elijah E. Cummings, Democrat of Maryland, said, "The person I believe most is Mr. Pettitte." Representative Mark Souder, Republican of Indiana, said the same thing to ESPN ("I find Clemens almost as believable as Rafael Palmeiro"). Bingo. Pettitte is the smoking gun. It's established that McNamee gave true testimony about administering steroids and/or HGH to Pettitte and Chuck Knoblauch. Both players corroborated McNamee's statements. And we are supposed to believe that McNamee invented this whopper about Clemens and only Clemens? Pettitte's deposition shreds Clemens's story. Under oath, Pettitte told Congress that Clemens admitted using HGH. Twice. Pettitte said he relayed the conversations to his wife. Mrs. Pettitte recalls the conversations and said so in her affidavit. Clemens was unable to explain this, other than to insist Pettitte "misremembered." "You're one of my heroes, sir, but it's hard to believe you," said Cummings. McNamee is a lousy witness. If the government wants to lay a perjury rap on Clemens, McNamee's credibility can be easily destroyed. But Pettitte remains a problem. He's believable. He's already fessed up to HGH. His wife is believable. Like McNamee, they have nothing to gain by lying. Unlike McNamee, they are credible. Too bad so many fawning reps chose to ignore the most important new testimony. Clemens looked bad in a couple of other areas. He continues to insist that he did not know Mitchell was looking for him and that he did not know what was going to be in the report (he even managed to throw the Hendricks brothers under the bus by claiming they didn't tell him Mitchell was looking for him). More lies. Clemens has been contradicted on both issues several times. Oh, and then we have the smoking nanny. Waxman stunned Clemens and got his lawyers (Lanny Breuer and Rusty "P.T." Hardin) to stand and object when he revealed the committee's knowledge that Clemens might have tampered with a witness. Knowing that the committee wanted to speak to the nameless nanny to shed some light on Clemens's appearance (or non-appearance) at a Jose Canseco party in 1998, Clemens invited the nanny to his house last weekend, even though he hadn't seen her in seven years. After speaking with her, he finally turned her name over to the committee. Her story contradicts the stories of Clemens and Canseco -- who surely goes on the Mount Rushmore of Liars. We still have no idea where the physical evidence (McNamee's bag of medical waste, a.k.a. "the blue dress") will lead. But it can't be good for the Rocket. Clemens wanted this audience. He insisted on his moment in front of Congress. He wanted the chance to stand up under oath and tell all of America he never used steroids or HGH. The committee chairman told us all we could use the testimony to make up our minds about who is telling the truth. It worked for me. I think Clemens is lying. He may never face a perjury charge and he may yet sail into the Hall of Fame on the first ballot. But when the mud stopped flying today, Clemens was the one who looked dirty. What's the toll for Yankees' Pettitte? discuss Did the hearing fail to deliver answers? survey Whom do you believe, McNamee or Clemens? globe 10.0 Were there any winners at the hearing?